A sixteen ingredient, nutritionally fortified, cook and serve mix that will appeal to all medium and large hookbills. 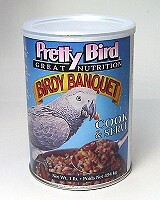 Birdy Banquet contains rice, beans, pasta, seeds and assorted fruits and vegetables, with a vitamin and mineral supplement. It's an easy to prepare mixture that's sure to tempt even the most particular parrot. We find that it's especially appealing to those birds that prefer "people food."